A few years ago, Chris Allen wrote this personal vision statement; “I’m called to facilitate the development of authentic leaders in the next generation.” As Movement’s Chief Talent Officer, he is passionate about loving, valuing and developing the company’s greatest asset – it’s people. 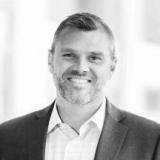 The former Charlotte Eagles soccer athlete-turned-pastor-turned-talent-guru is at the top of a pyramid of employee-focused programs, such as Human Resources, the Thrive culture department, training, leadership development and recruiting. He would be the first to tell you, however, that the Movement Mortgage value of servant leadership means acting with bottom-up humility. It also means creating a workplace of purpose, one that highlights strengths and values individual gifting. The kind of place that attracts and retains the evasive millennial group. This success has drawn the attention of other organizations. In this second year of his tenure, Chris has added event speaker to his role, traveling to teach on leadership and development in the workplace. No matter how exciting the week is, weekends are for family. One of his favorite ways to spend them are alongside his wife, Jamie, cheering on their four kids in sports games - soccer, of course. Movement Mortgage, the country’s fastest growing mortgage bank, was founded on a mission that was hardly financial. With the goal of serving one out of every ten homebuyers in the United States by 2025, this growth isn’t slowing. Existing to love and value people, Chris Allen, Movement Mortgage’s Chief Talent Officer, shares how the organization’s people-focused purpose and culture has lead to the company’s success and rapid growth. Learn just how a bold and perhaps out-of-the-box mission can be a game changer for holistic engagement (for employees and customers).